The UNHCR Nansen Refugee Award is awarded annually by the United Nations High Commissioner for Refugees to an individual, group, or organization in recognition of outstanding service to the cause of refugees, displaced, or stateless people. 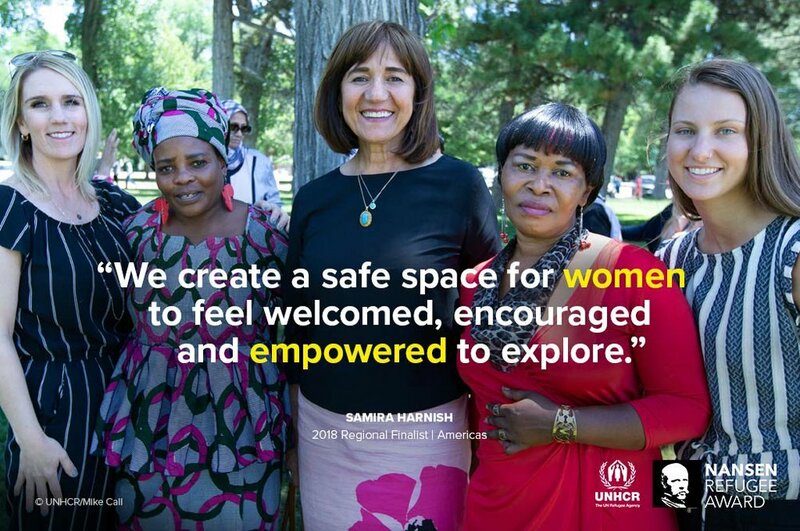 This year Samira Harnish was recognized for leading Women of the World in supporting the women refugees, asylum seekers, and immigrants that have fled their homes and resettled in Utah. Samira Harnish has been recognized by numerous women's groups and by Salt Lake City for her work with refugees but this is her first international recognition. Samira, herself an Iraqi immigrant, helps them adjust. She does not take “NO” for an answer. Ten years ago, she was climbing the corporate ladder as an award-winning electrical engineer and executive, earning a six-figure salary and living the American Dream. Yet something troubled her. Often, when she drove home from work or carried out errands around Salt Lake City, she would encounter refugee women struggling to speak English, unfamiliar with the transportation system or having problems at the supermarket checkout. Samira would offer to help. She spoke Arabic and would frequently meet women from Syria, Somalia, Yemen and her native Iraq. On snowy winter days, she would drive them home in her car so that they would not have to wait for a bus. For the first six years, Samira’s car was her office. She was constantly making calls, sending emails and knocking on the doors of government offices in support of “my ladies”. “After your heart is troubled, you come in the office to see Samira, you will return, you are happy. You have solution,” said Rosette Kindja, a single mother and refugee from the Democratic Republic of the Congo, who was resettled in Salt Lake City two years ago. Samira and WOW helped Rosette to find a job and learn English, one of more than 1,000 women it has helped in the past decade. For her work Samira was chosen as the Americas’ regional finalist for the 2018 Nansen Refugee Award. The prestigious Nansen award is named in honour of Norwegian explorer and humanitarian Fridtjof Nansen, the first High Commissioner for Refugees, who was appointed by the League of Nations in 1921. It is granted annually following an exhaustive global review of nominations. Samira is interested in "putting Utah on the map" as a place well-resourced to assist and compassionate to the suffering of refugees, asylum seekers, and immigrants. "Utahns want to be good neighbors. We are introducing our ladies simply as 'your new neighbors' and believe this frames the situation correctly. When neighbors help one another, let their kids play together, and work together to make the community better, self-reliance results." Women of the World is interested in utilizing this international recognition to show the economic, academic, and cultural benefits of including our new neighbors into our schools, workplaces, and community. Samira has been on numerous news programs and government/non-governmental think tanks responsible for designing innovative approaches to continuing Utah’s support of displaced women’s self-reliance and would be interested in furthering all these venues.